Beretta Nano 9mm Compact Factory 6 round Magazines JM6NANO9 Flush Fit Flat Plate Buy 3 Ships Free! Description: NO MAGAZINE SALES into NEW YORK CITY. CONNECTICUT residents must furnish us a copy of your CT Eligibility Permit or ammunition certificate. This listing is for ONE Magazine. Buy 3, or any 3 non gun non ammo items, and shipping is Free for the entire order, lower 48. Here is Beretta’s smallest, flat plate, short, concealable variant of the Nano’s factory magazine. Manufacturer and warrantor is Beretta USA of Gallatin, Tennessee. Construction is smooth finish stainless steel body with viewing ports, steel spring, and blued steel cartridge follower. Floorplate is stainless inner against hard polymer outer plate, grooved for fit to the pistol and for easy disassembly for cleaning and maintenance. Each magazine holds 6 rounds of 9mm ammunition – 9mm Luger, 9mm Parabellum, 9x19, call it what you will, THE 9mm. Each magazine is factory packaged. Factory part number is JM6NANO9. The unpackaged photo specimen came with one of the new pistols we had in stock at press time on this ad. 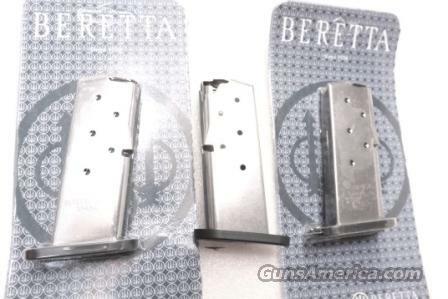 These magazines will only fit a Beretta Nano pistol chambered in 9mm caliber. They will not fit a Smith & Wesson Shield, will not fit a Walther PPS, will not fit a Kel-Tec PF9, will not fit the 8 track tape player of a 1969 Pontiac Grand Prix. Replacement pricing on them in our area, when a person can even find One, is upwards of $40 apiece. We’re offering these new Beretta Magazines each, however, for only	$ 23.00. Not for sale to residents of New York City. Any magazine deliveries into New York City require written permission from the Police Commissioner, so we cannot ship magazines into New York City, per NYC Code 10-131.10. Connecticut buyers must furnish us a copy of your State Issued Eligibility Permit or Ammunition Certificate, per P.A. 13-220. Any ammunition, firearms, or personnel showing in any of our photos are NOT included. $3 Lower 48 First Class Mail Padded Envelope; $10 Priority to AK HI PR. First Class sometimes requires removing the item from its package.